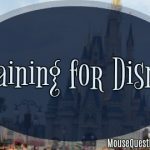 The decision to stay onsite or offsite at Walt Disney World is a hard one. It often comes down to magic vs. money. You know staying on-site will offer you the ability to be immersed in the magic. However, as Rumpelstiltskin says, that magic comes at a price, Dearie. If you can afford it… fantastic!! If you can’t… you still have options. 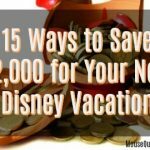 How would you like to save up to 52% by using Vacation Resorts by Owner for your Disney accommodations? WHAT IS Vacation Resorts By Owner? 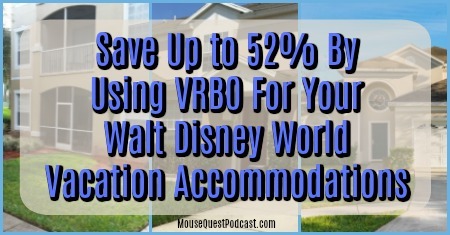 If you really want to maximize your savings you need to check out the possibilities available for off-property accommodations via the Vacation Resorts by Owner (VRBO) website. This site is a clearinghouse for every type of rental you can imagine from condos to townhouses to villa homes. 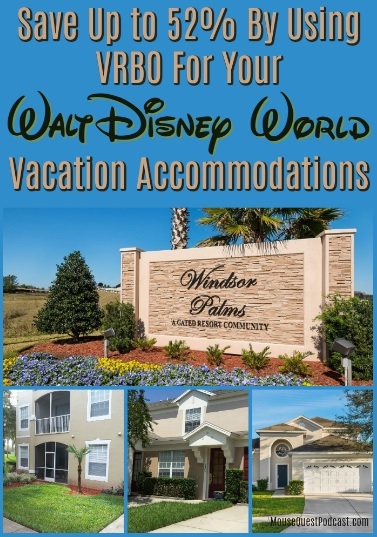 As a sports team mom, and eventually team owner, I used VRBO to find and book our accommodations for as many as 12 families for Nationals at the ESPN Wide World of Sports Complex. As you can imagine, when making reservations for that many families I needed to find accommodations for all budget levels and family sizes. Do they need a first floor location because they are bringing Grandma? Do they want an attached pool? Are they looking for low-cost alternatives or on-property elegance at half the price? Through VRBO, we found a gated community called Windsor Palms. What first drew my attention was the variety of accommodations available. They have 2 – 4 bedroom condos, 3 bedroom townhouses and 4 – 6 bedroom villa homes. The best part is all accommodation styles have full kitchens which will save lots of money versus eating out. Most houses and townhouses at Windsor Palms even have their own private pool. It also has all the amenities you would expect from a resort including a large clubhouse, huge swimming pool, pool Tiki bar, kids splash pad, hot tub, tennis courts, basketball court, shaded picnic area, 58-seat movie theatre, state-of-the-art fitness center, video arcade, and a beach volleyball court which my volleyball-playing daughter LOVED. I have to be honest, the first time we were booking off-property accommodations at I was a little worried. During my research, I had found some horror stories at other resort complexes where there were bug-infested condos and villas with no access to resort amenities. Thankfully, the owner I rented from at Windsor Palms was so patient and kind answering all of my questions. That is another great part of the VRBO experience. You are able to contact the owners directly to ask questions and seek guidance. When we arrived in Florida, we drove through the gate at Windsor Palms and I knew we had made the right decision. Windsor Palms was beautiful. The landscaping was immaculate, the pool was pristine and our condo was perfect appointment, clean and well stocked… we’ll talk about our specific condo more next week. Choose your arrival and departure date. Choose the number of bedrooms you need. Scroll down through the hundreds of listings to find the one that fits your size and budget needs. When you find a place that fits your needs click on the link to the full information. From this page you can ask the owner a question or book your accommodation. Make sure to read the comments from past renters. You can learn a lot about the property owners and the property itself from the previous guests. If it’s not spelled out: Ask their deposit costs, terms for payment and damage deposit? What is their cleaning deposit? Some will waive the cleaning deposit if you are staying over 7 days. Comparing the cost of staying on-property vs. renting a property with VRBO has to include all associated costs on both sides of the equation to make it an apples-to-apple comparison. For example, sure there is a $60 per night saving to stay in a condo, but you also have to include a rental car or book airport transportation and use Uber to get to the parks. 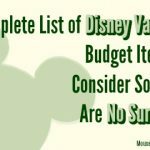 Conversely, when staying on-property, you will eat 100% of your meal in the parks or at your resort and we all know how expensive on-property meals can be and, as March 21, you will have to pay up to $24/night more if you driving to Disney and parking your car at your resort. 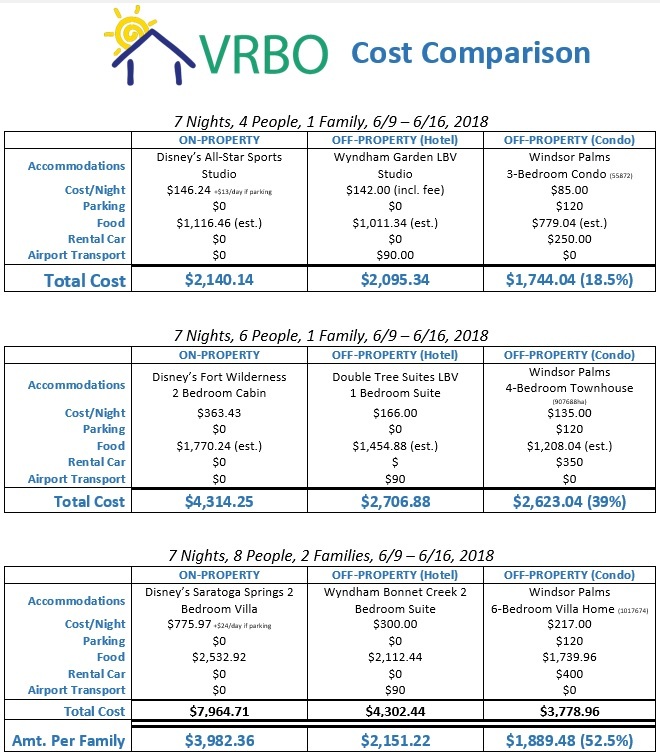 So here is an honest comparison of staying on-property versus using VRBO to book off-property accommodations. Scenario #1: One family of four (Mom, Dad, 2 kiddos). 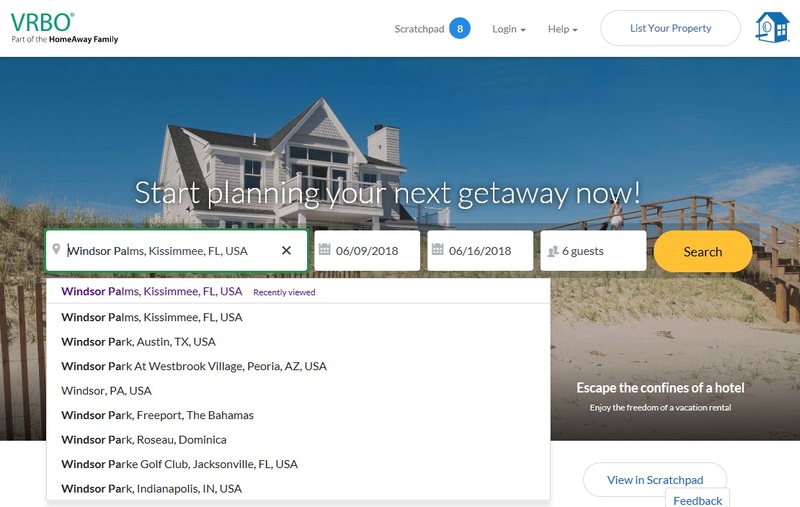 All scenarios used the dates of 6/9 – 6/16/2018, staying 7 nights. When choosing an off-property hotel you will choose one which offers free transportation to the parks. As you can see, depending on the accommodations you are seeking, you can save up to 52.5% over the on-property cost. That’s a crazy huge savings. 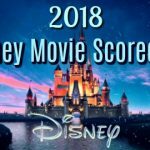 Think about this: That one family of six could rent the 6-Bedroom villa home by themselves and still save 12% over a cabin at Disney’s Fort Wilderness Resort. Yes, I completely understand. I know there is a magical feeling when staying on property. 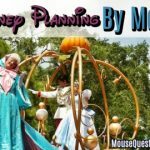 However, why deny yourself of all of the magic because Walt Disney World Resort hotels are not affordable. Like I said before, if you can afford to stay on property… YIPPY SKIPPY! If you can’t, check out Vacation Resorts by Owner as a great option to save money. 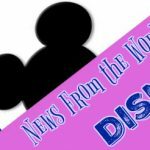 Sue Nowicki is an alumna of the 2014/15 Disney Parks Moms Panel. She is a recovering team mom who is trying to find ways to fill her time after serving secretary, navigator, head cheerleader, treasurer, athletic trainer and team psychologist for her daughter’s travel sports team for 10 years. You can follow her on Twitter @MQPodcast.